Table, seasoned, kosher, smoked, grey, truffle and rock are among the types of salt that have their place in the home kitchen. Washington Post, “‘Salt to taste,’ taken with a grain of regret,” by Bonnie S. Benwick. “Salt, to taste” is an instruction that appears in almost every recipe on my site. I rarely specify the amount of salt in a recipe because 1) I don’t really measure it and 2) it’s a subjective matter of taste how salty many dishes should be. Benwick gives the subject a thorough examination in the centerpiece of several articles in today’s Food section in cooking with salt, the most common and popular seasoning and the only thing we eat in significant quantity that is technically a rock. 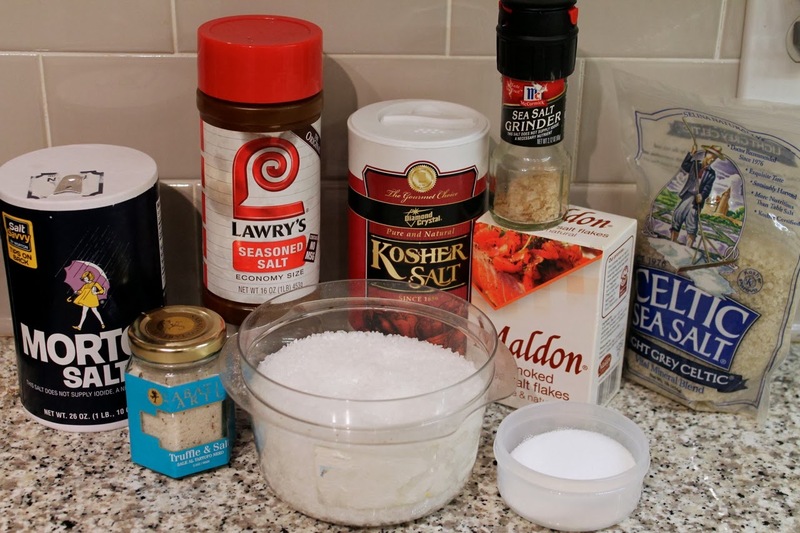 Her article looks at proper seasoning of food with salt in home cooking, a subject on which there is general agreement that few home cooks do it properly, but some disagreement over how to correct that situation. A sidebar shares the Food section’s thoughts on proper salting. Jim Shahin also contributes a story on cooking with smoked salt, an ingredient useful for bringing outdoor flavors inside during cold winters. His Asian-Style Alder-Wood-Smoked-Salt Salmon sounds fantastic. Washington Post: “Raw eggs in cocktails: Worth the whisk?,” by M. Carrie Allan. I’ll admit it: raw eggs make me squeamish. I won’t even sample raw cake batter (well, okay, I do sample it sometimes). I know the chance of getting salmonella is small, and I’m not in a high-risk group, but still. However, raw egg adds a specific texture to certain drinks that can’t otherwise be replicated, which is the subject of Allan’s latest Spirits column. Even pasteurized eggs don’t really work as Allan found out when she tried to make a flip with them and was disappointed with the results. Epicurious: “American Hustle, 12 Years a Slave, Her, and More 2014 Oscar Nominees Celebrated in Food,” by Lauren Salkeld. Last year, I created original cocktails for all of the Oscar Best Picture nominees—which I’ll be doing again this year, by the way, starting next week. Others have done this too, as well as dishes inspired by the film. But Salkeld takes it a step further, assembling whole menus for each film using existing Epicurious recipes. Her menus are quite clever, nodding to little details in each film. They also sound really good, particularly the Southern leanings of 12 Years a Slave (Braised Pork Hash) and African stylings of Captain Phillips (Samosas and Doro Wett Chicken Stew). Serious Eats: “Back of the House: What Does a Food Stylist Do?,” by Jaya Saxena. Serious Eats debuted its Back of the House column last week, a new feature chronicling interesting careers in the food industry. First up, Saxena profiles food stylist Lisa Homa with an interesting discussion of how food styling has evolved in recent years and even a brief mention of its (sometimes questionable) ethics. Wall Street Journal: “Mocktails Come of Age,” by Elizabeth Gunnison Dunn. I love cocktails, but for various temporary or permanent reasons, some folks don’t drink and that’s okay. They deserve better than a soda though, which is why the ability to make a good mocktail is important. I did a decent mocktail version of a cosmopolitan last summer, although I really like that the recipes that accompany this story are original drinks and not just virgin versions of popular cocktails. The Little Ferraro Kitchen: “Vegetarian Pasta Fagioli,” by Samantha Ferraro. Last year, I made a wonderful Pasta e Fagioli soup using a Marcella Hazan recipe. As delicious as it was, since it contains pork, it’s not for vegetarians, despite its namesake focus on pasta and beans. Then just last week I had a wonderful vegetarian Pasta Fagioli soup from Oliverio’s in Bridgeport, West Virginia. So I was pleased to come across Samantha’s vegetarian recipe from her site The Little Ferraro Kitchen. Love that she uses parmesan rinds in the broth, which is such a great idea. NPR: “Grade Inflation In The Maple Syrup Aisle: Now Everything Is An 'A',” by April Fulton. Ivy League schools aren’t the only ones suffering from grade inflation these days, now all maple syrup will get an “A” thanks to a change in the syrup classification system. Fulton writes about how this is really an effort to correct the public’s misconception that Grade A syrup was “better” than Grade B when the grades were really used to signify different characteristics and not quality. NPR: “Meet The Cronut's Humble Offspring: The Doughscuit!,” by Ian Chillag. Had enough of the cronut? Here’s the next hybrid doughnut dessert, doughnut crossed with a biscuit. CNN: “The only sausage guide you will ever need,” by America’s Test Kitchen. A visual guide to sausage is just what the world needed. Seriously! This is great primer on the popular spicy encased meats. New York Times: “There’s a Reason That Rye Is Having a Moment,” by Rosie Schaap. Quartz: “The world according to hard alcohol,” by Roberto A. Ferdman and Ritchie King. Ferdman and King have assembled a fun infographic showing which of the most common spirits are most popular around the world country-by-country. Vodka and whiskey appear to be the most dominant, and I was surprised that vodka is more popular than gin in Britain. Braised pork hash: Yes, please! Also: You won't allow me to taste cake batter but you do? I cry foul.